We are a professional medical office providing the highest level of patient care for over 27 years. Evan B. Shapiro, M.D. is a Board Certified physician and a member of AACS (American Academy of Cosmetic Surgery) and ASLMS (American Society for Laser Medicine and Surgery). Ina Lutin, RN is a registered nurse, Board Certified in Micropigmentation and a member of AAM (American Academy of Micropigmentation) and SPCP (Society of Permanent Cosmetic Professionals). We have been successfully providing skin care and laser treatments for over eight years. Our Q-Switched Laser manufactured by Focus Medical is the most powerful Q-Switched laser on the market, designed for treatment of nail fungus and tattoo removal. It is estimated that close to 10% of people in the U.S. have a tattoo. Eventually, as many as 50% of them want to have the tattoo either removed or lightened in preparation for a cover up. There is good news for those who have an unwanted body design. In the past, tattoos could be removed by a wide variety of methods but, in many cases, the scars were more unsightly than the tattoo itself. However, today the newest techniques and most powerful lasers can remove your tattoo with minimal, if any, side effects. Here’s how it works: lasers remove tattoos by breaking up the pigment colors of the tattoo with a high-intensity light beam. Our bodies then gradually eliminate the smaller fragments of the ink. Depending on the size and color of your tattoo, the number of treatments will vary. 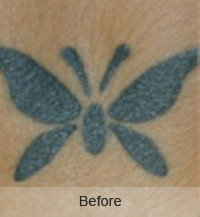 Black tattoo pigment is the easiest to treat. Other colors, such as red, green, yellow, orange and blue are more difficult and require different wavelengths of laser light to remove them. 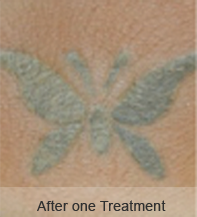 Because each tattoo is unique, removal techniques must be tailored to suit each individual case and should be performed by a skilled, Board Certified Physician. We use the NaturaLase laser made by Focus Medical, the most powerful Q-Switched laser available for tattoo removal, lightening and nail fungus. This laser is a Q-Switched Nd:YAG laser and can remove all colors of tattoo ink. It produces two joules of power per pulse. What that means is that it treats your tattoo with two times more energy than any other laser on the market. The extra energy is used to treat a larger area of your skin per pulse of light. Treating a larger area with each pulse, called the “spot size”, has important benefits. By starting with a larger spot size, as the light funnels down into your skin, it is able to penetrate deeper in the skin and break up the ink that resides in the lower layers of the dermis. This results in our ability to remove more ink and allows us to keep the energy at the skin surface lower so you have less chance of having any side effects including scarring and hypopigmentation (whitening of the skin). Toe Nail Fungus is the most common disease of the nails and constitutes about a half of all nail abnormalities. Its medical name is Onychomycosis (also known as dermatophytic onychomycosis, ringworm of the nail and tinea unguium), which means fungal infection of the nail. This condition may affect toenails or fingernails, but is more common in toenail infections and is present in about 6-8% in the adult population. Nail fungus can be very embarrassing. The most common symptom of a fungal nail infection is the nail becoming thickened and discolored: white, black, yellow or green. As the infection progresses the nail can become brittle, with pieces breaking off or coming away from the toe or finger completely. If left untreated, the skin can become inflamed and painful underneath and around the nail. There may also be white or yellow patches on the nailbed or scaly skin next to the nail. There is usually no pain or other bodily symptoms, unless the disease is severe. Nail fungus tends to affect men more often than women, and is associated with a family history of this infection. Other risk factors include perspiring heavily, being in a humid or moist environment, psoriasis, wearing socks and shoes that hinder ventilation and do not absorb perspiration, going barefoot in damp public places such as swimming pools, gyms and shower rooms, having athlete’s foot (tinea pedis), minor skin or nail injury, damaged nail, or other infection, and having diabetes, circulation problems or a weakened immune system. Treatment of onychomycosis is challenging because the infection is embedded within the nail and is difficult to reach; full removal of symptoms is slow and may take a year or more. In the past, treatment was a lengthy process and was either a systemic antifungal medication, or a topical medication, such as nail paints. 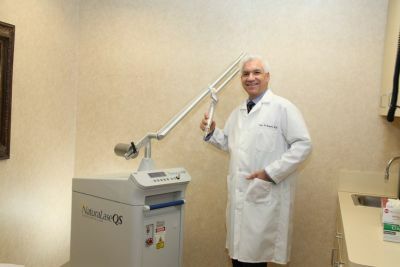 Today, Laser treatment is the newest, near painless and safe, treatment for toenail fungus. The laser treatment kills the pathogens that cause toenail fungus. The gentle laser zaps the toenail, killing the fungus instantly. Treatments take only about 15 minutes. How Many Laser Treatments Will I Need to Eliminate Nail Fungus? Most patients are cured with two treatments. Some patients will require additional treatments. We offer financing options that make tattoo lightening, tattoo removal or nail fungus treatment affordable for everyone. While tattoo lightening or removal often requires a financial commitment that can exceed the price of the tattoo itself, we provide several payment methods to ensure you stay on track with removal without falling out of budget.